Citation Information: J Clin Invest. 2003;112(11):1751-1761. https://doi.org/10.1172/JCI17595. Acute myelogenous leukemias (AMLs) are genetically heterogeneous and characterized by chromosomal rearrangements that produce fusion proteins with aberrant transcriptional regulatory activities. Expression of AML fusion proteins in transgenic mice increases the risk of myeloid leukemias, suggesting that they induce a preleukemic state. The underlying molecular and biological mechanisms are, however, unknown. To address this issue, we performed a systematic analysis of fusion protein transcriptional targets. We expressed AML1/ETO, PML/RAR, and PLZF/RAR in U937 hemopoietic precursor cells and measured global gene expression using oligonucleotide chips. We identified 1,555 genes regulated concordantly by at least two fusion proteins that were further validated in patient samples and finally classified according to available functional information. Strikingly, we found that AML fusion proteins induce genes involved in the maintenance of the stem cell phenotype and repress DNA repair genes, mainly of the base excision repair pathway. Functional studies confirmed that ectopic expression of fusion proteins constitutively activates pathways leading to increased stem cell renewal (e.g., the Jagged1/Notch pathway) and provokes accumulation of DNA damage. We propose that expansion of the stem cell compartment and induction of a mutator phenotype are relevant features underlying the leukemic potential of AML-associated fusion proteins. Citation Information: J Clin Invest. 2003;112(10):1589-1596. https://doi.org/10.1172/JCI19284. Basic and clinical observations suggest that thrombosis and inflammation are closely related. Here we addressed the role played by TNF-α in thrombus formation and growth in an in vivo mouse model. Using intravital microscopy, we show that systemic administration of TNF-α at doses found in sepsis transiently inhibits thrombus formation and delays arterial occlusion upon vascular injury. These results were reflected in a prolonged bleeding time. Platelets isolated from the TNF-α–treated mice showed a marked decrease in fibrinogen binding and P-selectin expression as well as reduced platelet aggregation in response to various agonists. In contrast, in vitro treatment of platelets with TNF-α did not affect their function. TNF receptor 1– and 2–deficient mice exhibited normal thrombogenesis in the presence of TNF-α. Additionally, the inhibitory effect of TNF-α was lost either after treatment with NG-monomethyl-L-arginine, an inhibitor of NO production, or in mice deficient for iNOS. These results indicate that under inflammatory conditions, when leukocytes need free passage to transmigrate into tissues, TNF-α decreases platelet activation and inhibits thrombi formation. This effect is not exerted directly on platelets but mediated through the rapid generation of NO in the vessel wall. Citation Information: J Clin Invest. 2003;112(6):853-862. https://doi.org/10.1172/JCI18882. Trousseau described spontaneous, recurrent superficial migratory thrombophlebitis associated with occult cancers, and this was later correlated with disseminated microangiopathy (platelet-rich clots in small blood vessels). Trousseau syndrome often occurs with mucinous adenocarcinomas, which secrete abnormally glycosylated mucins and mucin fragments into the bloodstream. Since carcinoma mucins can have binding sites for selectins, we hypothesized that selectin-mucin interactions might trigger this syndrome. When highly purified, tissue-factor free carcinoma mucin preparations were intravenously injected into mice, platelet-rich microthrombi were rapidly generated. This pathology was markedly diminished in P- or L-selectin–deficient mice. Heparin (an antithrombin-potentiating agent that can also block P- and L-selectin recognition of ligands) ameliorated this platelet aggregation, but had no additional effect in P- or L-selectin–deficient mice. Inhibition of endogenous thrombin by recombinant hirudin also did not block platelet aggregation. Mucins generated platelet aggregation in vitro in hirudinized whole blood, but not in platelet-rich leukocyte-free plasma nor in whole blood from L-selectin–deficient mice. Thus, Trousseau syndrome is likely triggered by interactions of circulating carcinoma mucins with leukocyte L-selectin and platelet P-selectin without requiring accompanying thrombin generation. These data may also explain why heparin ameliorates Trousseau syndrome, while vitamin K antagonists that merely depress thrombin production do not. Citation Information: J Clin Invest. 2003;112(6):883-891. https://doi.org/10.1172/JCI15483. Activation of A2A adenosine receptors (A2ARs) protects kidneys from ischemia-reperfusion injury (IRI). A2ARs are expressed on bone marrow–derived (BM-derived) cells and renal smooth muscle, epithelial, and endothelial cells. To measure the contribution of A2ARs on BM-derived cells in suppressing renal IRI, we examined the effects of a selective agonist of A2ARs, ATL146e, in chimeric mice in which BM was ablated by lethal radiation and reconstituted with donor BM cells derived from GFP, A2AR-KO, or WT mice to produce GFP→WT, A2A-KO→WT, or WT→WT mouse chimera. We found little or no repopulation of renal vascular endothelial cells by donor BM with or without renal IRI. ATL146e had no effect on IRI in A2A-KO mice or A2A-KO→WT chimera, but reduced the rise in plasma creatinine from IRI by 75% in WT mice and by 60% in WT→WT chimera. ATL146e reduced the induction of IL-6, IL-1β, IL-1ra, and TGF-α mRNA in WT→WT mice but not in A2A-KO→WT mice. Plasma creatinine was significantly greater in A2A-KO than in WT mice after IRI, suggesting some renal protection by endogenous adenosine. We conclude that protection from renal IRI by A2AR agonists or endogenous adenosine requires activation of receptors expressed on BM-derived cells. Citation Information: J Clin Invest. 2003;112(1):126-135. https://doi.org/10.1172/JCI17669. It has been proposed that bone marrow (BM) hematopoietic stem and progenitor cells are distributed along an oxygen (O2) gradient, where stem cells reside in the most hypoxic areas and proliferating progenitors are found in O2-rich areas. However, the effects of hypoxia on human hematopoietic stem cells (HSCs) have not been characterized. Our objective was to evaluate the functional and molecular responses of human BM progenitors and stem cells to hypoxic conditions. BM lineage–negative (Lin–) CD34+CD38– cells were cultured in serum-free medium under 1.5% O2 (hypoxia) or 20% O2 (normoxia) for 4 days. Using limiting dilution analysis, we demonstrate that the absolute number of SCID-repopulating cells (SRCs) increased by 5.8-fold in hypoxic cultures compared with normoxia, and by 4.2-fold compared with freshly isolated Lin–CD34+CD38– cells. The observed increase in BM-repopulating activity was associated with a preferential expansion of Lin–CD34+CD38– cells. We also demonstrate that, in response to hypoxia, hypoxia-inducible factor-1α protein was stabilized, surface expression of angiogenic receptors was upregulated, and VEGF secretion increased in BM Lin–CD34+ cultures. The use of low O2 levels to enhance the survival and/or self-renewal of human BM HSCs in vitro represents an important advance and could have valuable clinical implications. Citation Information: J Clin Invest. 2003;111(7):989-999. https://doi.org/10.1172/JCI15809. Endothelial cell production of anticoagulant heparan sulfate (HSact) is controlled by the Hs3st1 gene, which encodes the rate-limiting enzyme heparan sulfate 3-O-sulfotransferase-1 (3-OST-1). In vitro, HSact dramatically enhances the neutralization of coagulation proteases by antithrombin. The in vivo role of HSact was evaluated by generating Hs3st1–/– knockout mice. Hs3st1–/– animals were devoid of 3-OST-1 enzyme activity in plasma and tissue extracts. Nulls showed dramatic reductions in tissue levels of HSact but maintained wild-type levels of tissue fibrin accumulation under both normoxic and hypoxic conditions. Given that vascular HSact predominantly occurs in the subendothelial matrix, mice were subjected to a carotid artery injury assay in which ferric chloride administration induces de-endothelialization and occlusive thrombosis. Hs3st1–/– and Hs3st1+/+ mice yielded indistinguishable occlusion times and comparable levels of thrombin•antithrombin complexes. Thus, Hs3st1–/– mice did not show an obvious procoagulant phenotype. Instead, Hs3st1–/– mice exhibited genetic background–specific lethality and intrauterine growth retardation, without evidence of a gross coagulopathy. Our results demonstrate that the 3-OST-1 enzyme produces the majority of tissue HSact. Surprisingly, this bulk of HSact is not essential for normal hemostasis in mice. Instead, 3-OST-1–deficient mice exhibited unanticipated phenotypes suggesting that HSact or additional 3-OST-1–derived structures may serve alternate biologic roles. Citation Information: J Clin Invest. 2003;111(2):187-196. https://doi.org/10.1172/JCI15994. 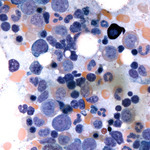 Hematopoietic progenitor cells (HPCs) normally reside in the bone marrow (BM) but can be mobilized into the peripheral blood (PB) after treatment with GCSF or chemotherapy. In previous studies, we showed that granulocyte precursors accumulate in the BM during mobilization induced by either GCSF or cyclophosphamide (CY), leading to the accumulation of active neutrophil proteases in this tissue. We now report that mobilization of HPCs by GCSF coincides in vivo with the cleavage of the N-terminus of the chemokine receptor CXCR4 on HPCs resident in the BM and mobilized into the PB. This cleavage of CXCR4 on mobilized HPCs results in the loss of chemotaxis in response to the CXCR4 ligand, the chemokine stromal cell–derived factor-1 (SDF-1/CXCL12). Furthermore, the concentration of SDF-1 decreased in vivo in the BM of mobilized mice, and this decrease coincided with the accumulation of serine proteases able to directly cleave and inactivate SDF-1. Since both SDF-1 and its receptor, CXCR4, are essential for the homing and retention of HPCs in the BM, the proteolytic degradation of SDF-1, together with that of CXCR4, could represent a critical step leading to the mobilization of HPCs into the PB in response to GCSF or CY. Citation Information: J Clin Invest. 2002;110(3):341-350. https://doi.org/10.1172/JCI15518.